Tonight the first 19 songs will compete in this year's Eurovision and 10 will qualify for Saturday's Grand Final. See all the details, songs and what to expect from tonight's Semi-final 1. Let the Eurovision Song Contest 2018 Begin! The 63rd edition of Eurovision Song Contest begins tonight! 19 songs will compete but only 10 will qualify for Saturday's Grand Final. The show starts at 21:00 CEST, live from Altice Arena in Lisbon, Portugal. Hosts are Filomena Cautela, Sílvia Alberto, Daniela Ruah and Catarina Furtado. The running order has been decided by the producer (Portuguese broadcaster RTP) based on an allocation draw. On Thursday Semi-final 2 will find the last 10 qualifiers out of 18 songs. After the 19 songs from the first Semi-final, a 1-minute preview of three of the six pre-qualified countries will be shown: Portugal, Spain and United Kingdom. These previews have been recorded yesterday at the jury rehearsals. Eurovision Song Contest 2018 starts on the ocean in rough sea becoming calm. This year's Eurovision's theme is maritime: All Aboard! Flying over the ocean and the famous bridges leading to Lisbon city. The next minutes we will see every tourist attractions in Lisbon, the old city, castles, trams, tiles on the houses... All the things that make Lisbon so beautiful. The camera is panning over the arena – All Aboard! – Inside the arena now. The four hosts of Eurovision 2018 Filomena Cautela, Sílvia Alberto, Daniela Ruah & Catarina Furtado say the famous: Good Evening Europe! (and also a welcome to the International Space Station). Two of the four female hosts, Filomena and Daniela are wearing simple black dresses, while Sílvia wears a big red dress and Catarina a blue dress. Filomena will host the Green Room. Next the hosts are talking – a lot. You can hear screams from seagulls and a rhythm starts. Like something is about to happen. But nothing is happening. The voting is introduced. Let the Eurovision Song Contest 2018 begin! There will be no interval act in this year's Semi-final 1. The time slot between the performances and the results are filled with recaps, voting instructions, interviews, videos, jokes, pre-qualified, but not a "show on stage act" as we are used to. After the 19 songs have performed on stage, it is time for the first recap of the songs. And the voting opens. We are brought back to Eurovision 2017 in Kyiv for a lookback on Salvador Sobral's victory last year. It starts with a video of some of last year's participants singing Portugal's winning song Amar Pelos Dois. Then the traditional videoclip with all the "Portugal 12 points" from last year. We are back in the Green Room with a funny act: The ones who receive the calls when you call and vote for your favorite Eurovision song – they are busy in thanking all for the calls. There are various videos now – some more funny than others. "Escopedia" is one of them, taking us back to history of Eurovision Song Contest with some of the fun facts – an introduction to a promotion of the new Eurovision Song Contest Board Game. Back in the Green Room the hosts speak with three of the six pre-qualified countries that will also broadcast and vote in Semi-final 1: Portugal, Spain and United Kingdom. A pre-recorded snippet of the three songs are shown. Results: The 10 songs qualified for Saturday's Grand Final. Good Night Europe. The voting procedure will be the same as previous two years. Each country will have two sets of 1,2,3,4,5,6,7,8,10 and 12 points to give. 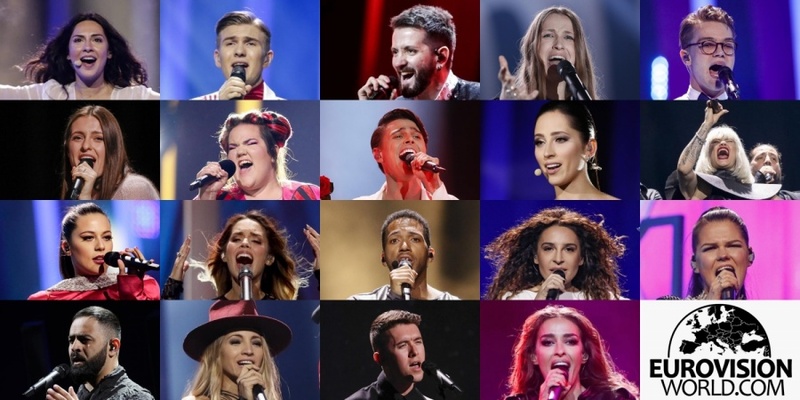 One set for each country's jury, and one set for each country's televoting. Each country has a national jury who gave one set of 1,2,3,4,5,6,7,8,10 and 12 points.